St. Mary Lake sits along the eastern end of the Going-to-the-Sun Road. The scenic lake offers views of the snow-covered Continental Divide to the west and the backdrop of beautiful sunrises to the east. 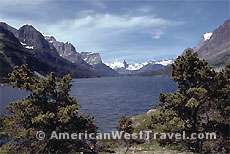 While the Lake McDonald Valley west of the divide has a very moist climate with dense forests and large trees, this east part of the park is more open and drier, a different perspective. However lakes, falls, and great mountain views are still found everywhere. There are a number of easy hikes to beautiful sights in the St. Mary area, especially around the west end of the lake. Sun Point Nature Trail. A turn-off from Going-to-the-Sun Road about 9.5 miles west of St. Mary visitor Center. A level 1.4 mile (round trip) trail with views of Baring Falls and St. Mary Lake. Sunrift Gorge. A spectacular cascade through a water-carved cleft between rock walls. Only 200 feet from parking area. A 0.3 mile (one way) trail leads to Baring Falls. A 250 foot elevation drop must be made up on the walk out. Pullout about 0.6 mile west of Sun Point. St. Mary Falls Trailhead. Just west of Sunrift Gorge. St. Mary Falls and Virginia Falls are two of the premiere attractions in the St. Mary area. It is 0.8 mile (one way) to St. Mary Falls with a 260 foot elevation drop. It is an additional 0.7 miles to Virginia Falls with a 285 foot elevation gain. Beaver Pond Loop. An easy 6 mile loop with minimal elevation change at the east end of the lake. The trail starts from the old 1913 ranger station on a spur road just east of the St. Mary Visitor Center. The hike to St. Mary Falls and Virginia Falls can be optionally combined with a high scenic boat cruise on St. Mary Lake, which offers views of waterfalls, cliffs, Sexton Glacier, and Wild Goose Island. The trail from the boat dock is slightly longer but more level. A short walk to Baring Falls is also included. Selected cruises include a ranger on the boat who leads the hike to St. Mary Falls. Cruises leave from the Rising Sun boat dock. Two Medicine Valley has a bit of an off the beaten path location in the southeast corner of Glacier National Park, away from the busy Going-to-the-Sun Road. No lodging here, but there is a scenic campground. The old Two Medicine Chalet has been converted to a camp store and gift shop. The area’s twisted and convoluted glacier-carved valleys offer some of the park’s most interesting trails and vista points. The fall foliage is reputed to be outstanding. The popular attraction at Two Medicine is the hike to Twin Falls and then on to Upper Two Medicine Lake at the foot of the Continental Divide. The trail leaves the North Shore Trailhead at the end of the road, follows the north shore of Two Medicine Lake, reaching Twin Falls in 3.8 miles with an easy 75 foot elevation gain. Upper Two Medicine Lake is 5 miles from the trailhead with a 350 foot elevation gain. You can combine the hike with the scenic boat cruise across Two Medicine Lake. This leaves a 0.9 mile (one way) hike to Twin Falls from the boat dock and 2.2 miles to the upper lake. The boat cruise cuts the hike to spectacular No Name Lake from 5 miles one way to 2.2 miles (with an 800 foot gain in elevation). No Name Lake is at the base of the sheer wall of Pumpelly Pillar. Ranger guided hikes are available to No Name Lake and several other destinations. Check at the ranger station for the current schedule. The very easy 0.3 mile trail to pretty Running Eagle Falls is ADA accessible. It leaves the park road about a mile west of the Two Medicine entrance. There is an easy 0.6 mile (one way) trail to Appistoki Falls from the South Shore Trailhead just east of the ranger station. A more exciting and challenging hike goes to Cobalt Lake tucked into the base of the Continental Divide. Along the way you will pass Aster Falls and Rockwell Falls. The lake is 5.7 miles one way from the South Shore Trailhead with a 1,400 foot elevation gain. There are additional interesting hiking opportunities from the remote and less heavily used Cut Bank Trailhead to the north (see map). Fishing is said to be very good for rainbow and brook trout in Two Medicine Lake. Be sure to review the park’s fishing regulations (below). St. Mary Lake boat tours, boat rentals, and guided hikes. 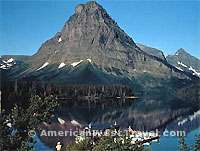 Two Medicine Lake boat tours, boat rentals, and guided hikes. The St. Mary Visitor Center is open late May to mid-October. Brochures, bookstore and gift shop. Maps and publications are available for sale. Rangers are present to answer questions, issue backpacking permits, provide emergency assistance, etc. The Two Medicine Ranger Station is open during the summer and provides maps, brochures, and interpretive programs. Restaurant, camp store, and showers located near the Rising Sun Motor Inn. Camp store and gift shop located at Two Medicine Chalet. Additional traveler services located in the towns of St. Mary and East Glacier Park.